The Illinois Judges Foundation will host its Spring Reception on Wednesday, April 3 from 5:30 to 7:30 p.m. at the Chicago Bar Association Building, 321 S. Plymouth Court, in Philip H. Corboy Hall. 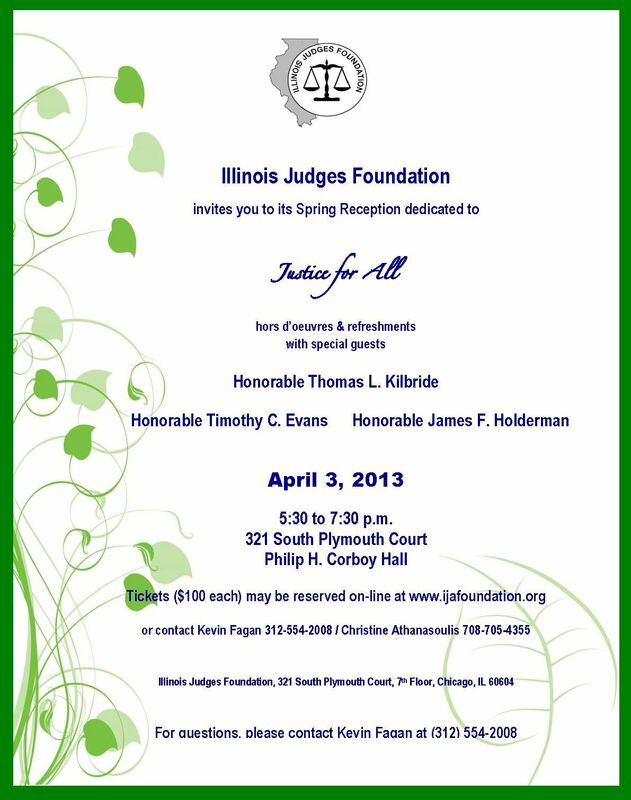 Circuit Court of Cook County Chief Judge Timothy C. Evans will present the IJF's annual Harold Sullivan Scholarship Award. The $5,000 award is given to a law student in good standing attending one of the nine Illinois law schools. Judge James F. Holderman, Chief Judge of the U.S. District Court for the Northern District of Illinois, will also provide remarks, including an original poem. 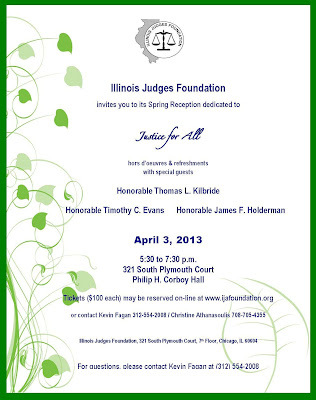 The IJF will also confer the Justice for All Award on Illinois Supreme Court Chief Justice Thomas L. Kilbride. The award is meant in appreciation for the commitment of Kilbride and the the Supreme Court as a whole to promoting equal access to justice, especially for the poor and vulnerable, particularly in the Illinois civil courts and administrative agencies. During Chief Justice Kilbride's term the Illinois Supreme Court has established the Illinois Supreme Court Commission on Access to Justice to further these goals. The IJF hopes to provide more than just public appreciation for these efforts: The IJF plans to earmark a substantial amount of the proceeds of the April 3 fundraiser to fund an externship for an Illinois law student to work with the Supreme Court Commission on Access to Justice, to assist with the work of the Commission, and to raise awareness among the future lawyers of this state of the importance of equal access to justice for all. Tickets for the IJF fundraiser are $100 each and sponsorships are available (Bronze Sponsor, $ 250.00; Silver Sponsor, $ 400.00; Gold Sponsor, $ 500.00; or Platinum Sponsor, $ 1,000.00). To purchase tickets or to help sponsor for the event, click on this link. For questions, call any of the numbers in the flyer shown above or email ijf@chicagobar.org. No, we don't yet have blue carts. But 41st Ward Ald. Mary O'Connor has announced a new drop-off recycling location for cans, glass, papers and plastics at the old 41st Ward yard, 6453 W. Higgins. There are two other drop-off locations in the 41st Ward, at Chevalier Woods, 5530 N. East River Road, and the (almost always overflowing) location at Milwaukee and Devon. If you're in another part of the City, click here to see a map of other City drop-off locations. On April 6, from 9:00 to noon, the 41st Ward will conduct its annual Electronics Recycling Day. This year, the event will be held at Immaculate Conception School, 7263 W. Talcott. 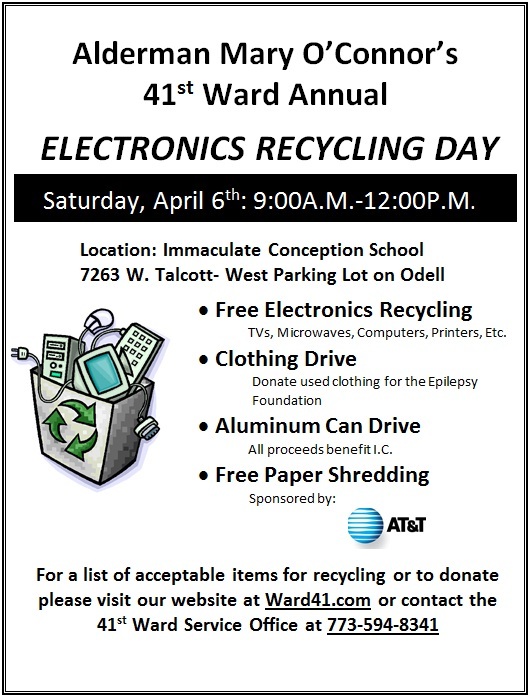 In addition to electronics, clothing will be collected (with proceeds going to the Epilepsy Foundation), and aluminum cans (with proceeds going to IC School). Paper shredding will be offered by AT&T -- and folks can also drop off their old newspapers in the collection bins now relocated to the same west parking lot of the school where the April 6 drive will take place. For those who like to plan ahead, Chicago's citywide Clean and Green Volunteer Clean-Up will take place April 20. Registration closes April 12 (click on the link for more information). What follows is not a comprehensive list of Cook County judicial vacancies, but rather a list of vacancies that have been filled by Supreme Court appointment. There may be (and often are) vacancies which the Supreme Court has not filled. There will be additional vacancies, and additional appointments between now and late fall when the Illinois State Board of Elections posts an authoritative list of judicial vacancies in anticipation of the 2014 primary. As always, errors or omissions in this list are mine alone and I am grateful for additions and corrections provided. Vacancy of the Hon. Nancy J. Arnold -- Alfred M. Swanson, Jr. Vacancy of the Hon. P. Scott Neville -- Gregory Emmett Ahern, Jr.
* This vacancy was created by the resignation of Judge Susan J. McDunn and assigned to the 11th Subcircuit. This was initially reported as a 10th Subcircuit vacancy, but that error was corrected by the Court. ** Judge Kenneth L. Fletcher was appointed to this vacancy, but that appointment expired on December 31, 2012. By my count, the new list of applicants for Cook County Associate Judge includes 12 judges currently sitting by Supreme Court appointment, including the jurist most recently appointed, Judge Jean M. Cocozza. Nine former judges are also seeking to return to the bench. A total of 277 persons reportedly applied. One has since withdrawn. A complete list of the 276 remaining applicants follows. The precise number of vacancies available has not been publicized. Under Supreme Court Rule 39, there had to be at least five associate judge vacancies before applications for a new class could be sought. The number of vacancies may increase before this list is pared down to two finalists for each vacancy -- but, for example, there were only nine vacancies when the last group of associate judges was chosen in April 2012 (and applications for that class closed in November 2010). The Circuit Court of Cook County is inviting "anyone with relevant information regarding any associate judge candidate to communicate by letter to the Circuit Court of Cook County Nominating Committee, c/o Chief Judge Timothy C. Evans, 50 West Washington Street, Room 2600, Richard J. Daley Center, Chicago, Illinois 60602." Please email me if you spot any errors or omissions in this list.